Full automatic, No bottle no filling, No cap machine stop. Application: Juice, energy drink, tea beverage etc. hot filling. Designed applicable cap: plastic screw cap. Easy operate for changing different bottle volume. 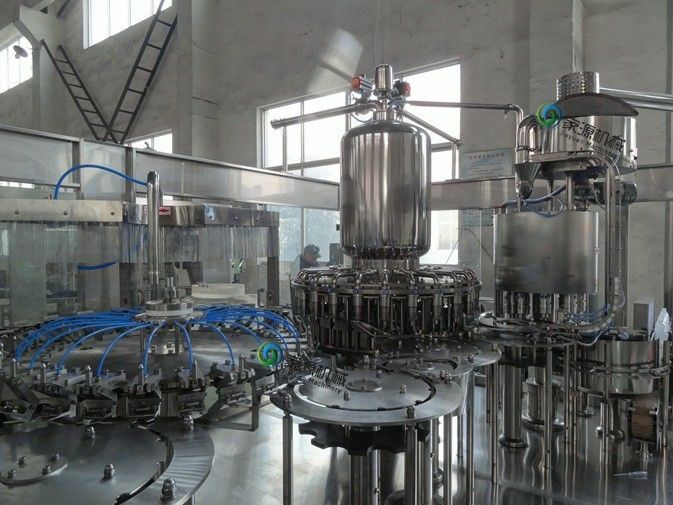 This Energy Drink Filling Machine adopts German technology, combined with years of experience in the Company after the development of new products. RCGF series hot juice filling machine is the standard 3-in-1 RFC (rinsing, filling, capping) monoblock. But for special production condition, another sanitizer rinsing could be added, that is 4-in-1 monoblock. The system has fully considered the beverage’s characteristics (such as the frothing of the tea drink and mixed juice) and the technical requirement of the hot filling. 3. Energy Drink Filling Machine uses normal pressure filling technology is filling fast, reliable, non-drip, level accuracy. The machine has no bottle no filling characteristics. 4. The Energy Drink Filling Machine uses magnetic torque cover, to achieve grasping cover, screw caps, screw cap stepless torque, constant torque of the screw cap, without damage cover, seal tight and reliable. 6. The whole Energy Drink Filling Machine adopts advanced man-machine interface operation, PLC control, variable frequency stepless speed regulation, such as automatic control technology, so that the whole of the high degree of automation, more reliable performance, production capacity can be adjusted continuously. 7. The main electrical, pneumatic components are world famous brand. Full filling to avoid the liquid level from sinking after the bottle cooling down, and to decrease the dissolved oxygen to the utmost extent. Reasonable structured storage hopper and material supply system make the material in constant flow speed, constant pressure without frothing. Usually high position tank is adopted. Recirculation tank system has the function of supplying the material automatically.